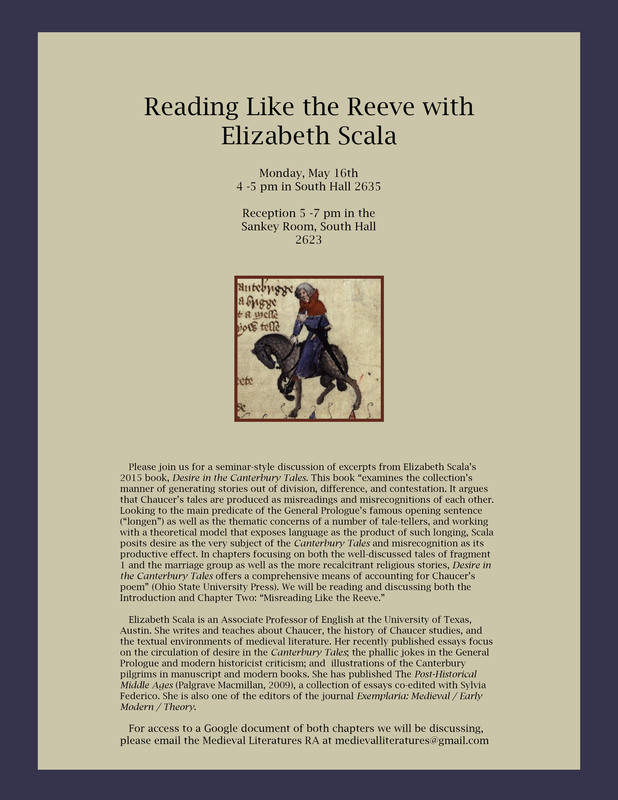 Please join us this Thursday, May 26th, from 12 – 2 pm in the Sankey Room (South Hall 2623), for a pre-mini-New Chaucer Society Conference! – “On the Beach,” the 3rd Biennial Meeting of the BABEL Working Group, will be held on the campus of UCSB from Oct.16-18. This conference will feature many medieval speakers, both from UCSB and elsewhere, on a wide range of subjects. We have done our best to plan an exciting and vibrant multi-disciplinary event, cutting across a wide swath of temporalities, fields, art- and design-practices, and institutional and para-institutional locations. “On the Beach” is co-sponsored by the UCSB College of Letters and Sciences, the Interdisciplinary Humanities Center, Film and Media Studies, Media Arts and Technology, Art, Comparative Literature, Spanish and Portuguese, Germanic and Slavic Studies, History, English, Literature and the Environment, Literature and the Mind, the Early Modern Center, and many other units on campus and off (a full list of co-sponsors is available on the program). Note that the IHC is devoting its 2014-2015 public events series to “The Anthropocene,” a topic that sponsors wonderful synergies between the themes and speakers of BABEL’s event and the IHC’s current concerns. The program can be found at http://babel-meeting.org/2014-meeting/2014-program/. We hope to see you during the conference — all sessions, plenary talks, and social events are open and free for UCSB students and faculty. Email Eileen Joy (eileenajoy@gmail.com) if you would like to pre-register. Please share the program widely; we thank you for your support. – Introducing a new writing and work-shopping group for the Medieval and Renaissance/Early Modern graduate student scholars in the English department. Our goal is to meet once a month, and discuss a piece of in-progress writing, circulated one week before the meeting. Works can include prospectus drafts, chapter drafts, seminar papers, conference papers, articles, or anything else on which like-minded scholars would like feedback from other pre-1650 scholars. Our first meeting will be Friday, November 21st, at noon, location TBA. We will be discussing a chapter draft by Jonathan Forbes, which will be circulated a week earlier, November 14th. At our second meeting, tentatively scheduled for mid-December, Kristy McCants will share and ask for feedback on a conference paper she intends to incorporate into a chapter. In addition to welcoming all of you to these two meetings, we also welcome any of the grad students to volunteer to have their piece work shopped. Please also feel free to email me with any questions. This will, we hope, prove to be a source of lively camaraderie and academic fellowship. We hope to see you all there! – Shay Hopkins will present her PAMLA Conference paper on the Havelok legend and historiography, Monday, October 27th, 10 am, location TBA. – Scott Kleinman, Medieval Literature and Digital Humanities professor at CSU Northridge, will be on campus Wednesday, December 3rd, time and location TBA. – Stay tuned for more announcements about upcoming speakers and events Winter and Spring quarters! Please mark your calendars for the upcoming annual Medieval Studies Program Graduate Student Conference, which will take place this year on Friday, May 17 (HSSB 4080) and Saturday, May 18 (McCune Conference Room). This year’s theme is, “Says Who? Contested Spaces, Voices, and Texts.” Panels will include speakers both from UCSB and several students visiting from other campuses. The conference is also pleased to host a performance by the Rude Mechanicals Medieval and Renaissance Players from Shepherd University: Four Medieval French Farces, from Professor Jody Enders’ “Farce of the Fart” and Other Ribaldries (Univ. of Pennsylvania 2011). This will take place on Friday, May 17 at 5pm in Theater and Dance West 1701. After the performance, there will be a talk-back with the actors and director, joined by Professor Enders. All welcome and open to the public; please encourage your students to attend! For a full conference schedule and location of events, please see the conference program: http://ucsbmedievalstudiesgrad.wordpress.com/program. Full conference information is available on the conference website: http://ucsbmedievalstudiesgrad.wordpress.com. Please join us for the 2nd Annual Medieval Literatures Lecture! Prof. Holsinger is Professor of English and Medieval Studies at UVA, but he is also the author of the forthcoming novel A Burnable Book (Harper Collins 2014) set in London in 1385 and featuring John Gower and Geoffrey Chaucer. publishing historical fiction and read selections from his novel.